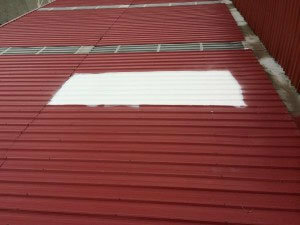 When You Do It Auto challenged us to put ThermaGuardHRC, the leading heat-reflective roof coating – to the ultimate test, we were excited to accept the challenge. You Do It Auto is a brand-new workshop concept for DIY car enthusiasts and motoring clubs. Comfort, safety and having fun around cars with great mates is the key to the concept. However, on summer days their tin roof offered little insulation to the outdoor heat and temperatures soared inside their shop. Providing air-conditioning was simply not feasible and ventilation wasn’t enough. That’s when owner, John Tidey, contacted ThermaGuardHRC for help. John Tidey challenged ThermaGuardHRC to absolutely show our insulating coating working using the science of infrared testing. Before investing in a full roof application of ThermaGuardHRC, John needed proof that our product would really control solar heat transfer in to his workshop. We took John up on his challenge with enthusiasm. Together, we organized for a square of You Do It Auto’s tin rooftop to be coated with ThermaGuardHRC. After we applied our product, we waited. We waited a few hours, for things to really heat up. 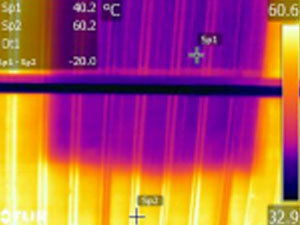 Finally, we took images of the underside of the tin roof using a FLIR thermal camera. The results were amazing. The uncoated area of the roof measured in at a whopping 60 degrees, while the area coated in ThermaGuardHRC measured 20 degrees cooler, at only 40 degrees. A comfortable space means happier clients and John knew he had found the affordable solution he needed against guys & girls leaving the workshop stinky and sweaty. After seeing these results, John went ahead and coated his entire roof with ThermaGuardHRC. Since You Do It Auto opened, John reports that his workshop is comfortable and cool and his clients love it. Not only that, reducing temperature also reduced overall humidity. Chemical solvents and cleaning polishes don’t linger in the air and the reduction in potentially harmful high-VOC vapours is an important OH&S benefit. For John’s clients it simply means they breathe easily in all conditions and it’s the simple things that matters most. If you have a building that you think would benefit from an application of ThermaGuardHRC, give us a call.